I had been learning to drive since February and was nervous about learning to drive as it was something I had never done. Paul’s lessons were planned around what I wanted to work on which meant that I was able to practice the areas that I needed. I found his advice very helpful. I found the LDC workbook helpful for passing my theory as everything I needed to learn was included. The book has lesson plans in which made it easy for me to see what I had achieved the lesson before and what I needed to work on. The LDC hub that Paul provided Free as part of the lessons was also helpful for practicing theory test questions and the hazard perception test which meant I was more prepared for my theory test. 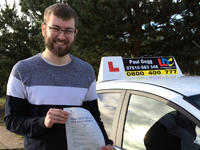 I would recommend Paul to anyone who wanted to pass their test and have all of the skills you need to be confident on the road. I found the lessons enjoyable and productive. I honestly cannot recommend Paul enough. I passed first time thanks to Paul and his teaching techniques! I always looked forward to lessons with Paul as he made me feel comfortable and the lessons were very much what I wanted to work on - with Paul suggesting ways to accomplish my goals. The LDC workbook and online videos that Paul provided helped me to consolidate my learning and get a head start on the next lesson which I found especially helpful. Paul's personality made the lessons a great laugh and I could trust him fully to have my back when I made mistakes and then help me to overcome them. I honestly cannot recommend Paul enough. Especially if you are feeling anxious about driving. That anxiety will soon turn into excitement under Paul's teaching! Thank you Paul. I passed my test with Paul in September 2018 and started only a few months before. He was very helpful and calm throughout all our lessons and made me feel extremely comfortable. Due to his calm and positive attitude he helped me learn fast and to the best of my abilities. He also gave me extra tools, such as the driving skills book to help keep track of my progress and answer any questions about driving. Because of his easy going personality I did not dread my next lessons, i looked forward to it even though I was not a confident driver to begin with. I would highly recommend Paul as he managed the lessons centered around me and individual to suit my needs. I cant thank Paul enough. Beginning my driving lessons, I was convinced I was going to be a bad driver so I was extremely nervous but as soon as the lesson started I felt so much more at ease. Paul made me feel comfortable and confident to drive; knowing he always had my back if I made a mistake was very reassuring. The lessons were fun and structured around what I wanted to practice; with the driving book I was given, I was able to learn basic controls and manoeuvres before attempting them in lesson which made them easier to understand and more achievable. I passed my theory test first time with the help of Pauls LDC hub which was a free website I could use which had practice questions and hazard perception tests; I’m not sure I would’ve passed first time without the hub. I also passed my practical test first time with only 1 minor which I was very pleased with!!!! 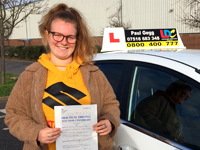 On the build up to my test, Paul took me on some driving test routes to do some mock tests which was extremely helpful as I learnt the basic lay out of the test and what I would have to do on the day. I was nervous coming up to my test, but I was confident I would pass. I would definitely recommend Paul and LDC to anyone wanting to learn to drive. The lessons were enjoyable and structured around me. I received a lot of support from both Paul and the LDC hub, approaching my tests which I think is why I did so well in both of them. I think the fact that I passed with only 1 minor speaks for itself though; I am now a safe and confident driver thanks to Paul and LDC! 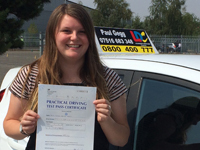 When I first started driving lessons with Paul I was a nervous wreck. The first thing I noticed was how friendly he was - very happy, a friendly face, a lovely personality. I really felt at ease when in the car with him. In each of my lessons there was a process; plan out what we are doing, know exactly where we were going, segregate the time if need be. Planning everything in advance meant I could be sure what I was doing, as well as him focusing the lessons on exactly what I needed to learn. When teaching me he always gave the best tuition - if I couldn't quite grasp what he was saying he always had his book to show me, or videos for me to watch at home. He really made the most of my time, and certainly gave me the best experience I could have. 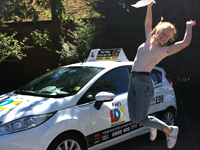 When I passed my test first time with one minor, I was extremely happy!!!! Paul had given me the confidence to drive, and now when I'm driving on my own I'm completely at ease. I have already recommended Paul to my friends, and would easily recommend him to you too. He taught me so well that I actually miss my lessons!